The PF Lyceum has posted a blog entry written by Guy Lyon Playfair about his new book on reincarnation. This year, I'm going to the 50th annual convention of the Parapsychological Association, and I plan to do it on the cheap. I'll be presenting a research brief and perhaps doing a workshop as well, so there's little chance that I'll be backing out. And call me crazy, but I right now I'm leaning toward driving there. Not needing a passport to cross the border by land was the clincher. It takes a lot of time and money to get a passport. Either way you look at it, I'm going to be out a few hundred dollars, so if you've ever felt inclined to take advantage of the paypal button to the right, now would be a most awesome time to do so. Otherwise, I might have to start selling candybars to my neighbors or something. Anyhow, this could be really fun, especially if I could find a couple of people interested in ridesharing. So if you live near the route below, and you're attending the PA conference, email me at annalisa@publicparapsychology.org. I may also be looking for roommates for the hotel. I hear we can stuff four of us a room. Now doesn't that sound fun? I might snore on occasion, but I take short showers and won't hog the bathroom. Alex Tsakiris, the man behind the podcast Skeptiko and the collaborative project Open Source Science was recently interviewed by Jacob at Mind-Energy.net. Alex will also be interviewed live today on the debut show of AfterlifeFM, hosted by medium and fellow blogger, Marcel Cairo. The evenings sessions of Day 2 of the ASPSI conference commenced with a talk titled Children's Near-Death States: New Research, A New Model by P.M.H Atwater. Atwater is a near-death experiencer and researcher of the phenomenon since 1978. 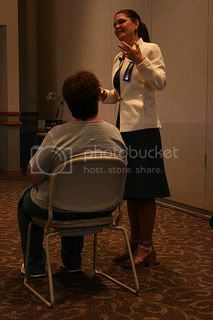 She has written many books on NDE's from a research base of over 3,000 adults and 277 child experiencers. In 2005, she was awarded the Outstanding Service Award from the International Association for Near Death Studies and the Lifetime Acheivement Award from the National Association of Transpersonal Hypnotherapists. Atwater's talk described ways in which the aftereffects of children's near death experiences are at variance with adults' NDE's. Child experiencers, if given the opportunity, express themselves differently than adults. Because of this, Atwater calls for a new model that engages the experiences of children at their own level. 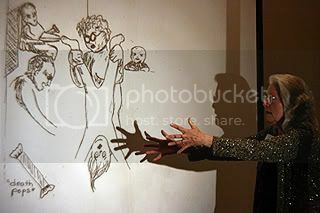 Throughout her talk, she discussed particular cases, and shared some sketches drawn by child subjects. The final session of the day was on Learning the Language of Spirituality and presented by Rev. Karen E. Herrick, who has shared her clinical expertise for the past 22 years in her private practice by lecturing throughout the United States on dysfunctional homes, grief, loss and dissociation. Herrick is about to finish her Ph.D. work, researching, writing, and speaking on Spiritual Psychology. Her talk discussed a spirituality group of 7 women that met for 20 months, and how the members developed together through spiritual experience, spiritual language, and personal growth. Alex Tsakiris of Skeptiko.com has put together a brief podcast highlighting some of the issues surrounding Dr. Rupert Sheldrake's and Dr. Richard Wiseman's look at the phenomenon of 'dogs that know when their owners are coming home'. The podcast also discusses the aims and replication goals of the recently launched site OpenSourceScience.net, and invites everyone to take part in the studies. Dr. Bem is a recently retired psychology professor of Cornell University, who has published on several diverse topics in psychology including ESP. In 1994, he co-authored a well-known article in a mainstream psychology journal with Charles Honorton that is considered a classic in the field of parapsychology. He has been one of the most popular RRC Summer School lecturers, where he also uses his ability as a magician to help educate students on how tricks can be disguised as genuine ESP. Read more about Dr. Bem's work at www.dbem.ws. Where: The Stedman Auditorium on the Duke Center for Living Campus, Durham, North Carolina. After such a fantastic keynote address on Day 1, the conference attendees eagerly awaited Dr. Raymond Moody's second day workshop, Reengineering the Mind: A New Logic of the Afterlife. Moody, a best selling author of 11 books, including Reunions and Life After Life , coined the term 'near-death experience' and has held university appointments in both philosophy and psychology. Today's workshop was about his most recent research on the concept of meaninglessness, unintelligible language, or nonsense. After pinpointing some common misconceptions about nonsense and setting them straight by selected readings from authors like Dr. Seuss and Lewis Carroll, Moody gave examples of several types of nonsense and revealed a structural pattern common to all types of nonsense. 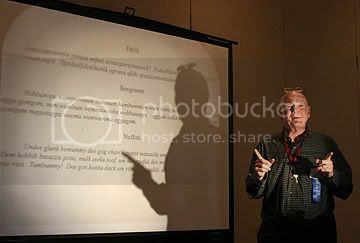 Following that, the conference attendees were given several minutes to write their own examples of nonsense and experience the mental effects of doing so. For me, creating nonsense was somewhat embarassing. I found myself covering up my page so that the folks next to me couldn't see what I was writing. The experience made me feel extremely vulnerable in a way that I find difficult putting into words. Dr. Moody has an entire training program for creating nonsense, and has found that people who do this for an extended period of time experience a mental shift that somehow makes them more open to anomalous experiences, and more importantly, gives them an alternate framework for describing them. My initial reaction to the exercise was very similar to the reaction that I have to anomalous experiences in general, so I suspect that Dr. Moody might just be on to something. 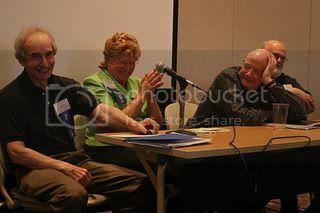 Following a short break, a panel comprised of Dr. Donald Morse, Betsy Jo Miller, Dr. Moody, and Rev. 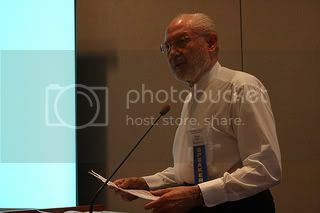 Harry Serio, PhD addressed the conference for a few minutes each on "Reflections on the Afterlife." The afternoon session closed with Dr. Charles Don Keyes, Professor of Philosophy at Dusquesne University reading his paper, The Integrity of Socrates' Arguments for Immortality in Plato's Phaedo. It's not everyday you'll find an essay about Why Parapsychology Matters in Academia, Science, and Society at a site promoting atheism. I think that this author at atheism.about.com, Austin Cline, is right on in his assertions. See the rest of his essays on parapsychology here. Although the Academy of Spirituality and Paranormal Studies is not strictly a parapsychological organization, the conference theme, What the Bleep do We Know about Life after Death?, is a question of interest to me and many of my fellow researchers in the field. Even though I didn't always find myself in agreement with the assertions of each and every presenter, it was truly a pleasure to be able to spend a weekend getting out of my own research groove and learning about other people's perspectives on our shared topics of study. 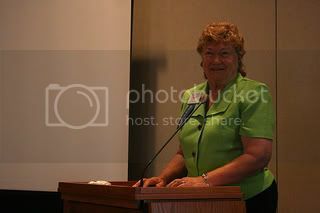 Boyce Batey, the ASPSI Executive director, introduced all of the speakers and kept the conference moving. And let me tell you, he runs a tight ship. So far every single session has begun precisely on time, and most of them have finished on time. During the morning session, Boyce kindly invited me to address the conference for a moment to announce this blog and my other project, OpenSourceScience.net. Thank you, Boyce! Donald R. Morse, DDS, Ph.D., ASPSI former President, Editor-in-Chief of The Journal of Spirituality and Paranormal Studies, and Professor Emeritus at Temple University opened the morning session with a presentation titled, Can Living a Long, Healthy, Happy, Moral an Spiritual Life Help Pave the Way to a Blissful Afterlife? During his talk, Dr. Morse, a weightlifting champion at the age of 76, spoke about important aspects of health and fitness. As intellectuals with an interest in spiritual matters, I think that researchers such as myself fall at risk of living entirely in our heads. It was refreshing to hear a presenter give consideration to the importance of the body. Following that, he discussed various religious viewpoints on the afterlife, especially in regard to their attitudes toward the human body. Following that, Karin K. Nemri, ASPSI Secretary/Treasurer, spiritual counselor, hospice volunteer, healer and lecturer shared what she gained from her own near-death experience and her journey to find meaning and purpose in her life. Ms. Nemri also gave a demonstration of a technique she calls 'Aiijii' healing. According to her description, "Spiritual Healers blend into her energy field, take control of her body from the neck down, and physically move her hands and arms to move and blend energy to manifest healing." 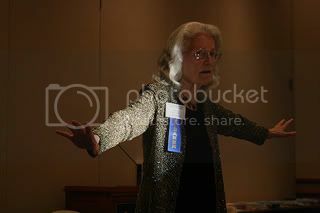 In a similar vein, writer and channeler Betsy Jo Miller spoke of her personal experiences following the death of her son, and presented her channeled material as it related to the conference theme. Greetings from Center Valley, Pennsylvania! 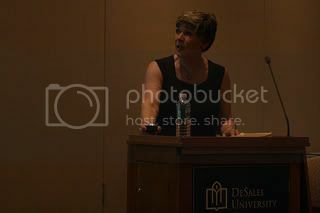 I'm blogging from the annual conference of the Acadamy of Spirituality and Paranormal Studies (formerly the Academy of Religion and Psychical Research), being held on the beautiful campus of DeSales University. I'm settled into Day 2 of the conference, and playing catch-up with the internet now that I am more coherent after a good night's sleep. First, let me take a moment to share a personal lesson. I do not recommend to anyone, under any circumstances, that they attempt an 8 hour drive on only 3 hours of sleep. 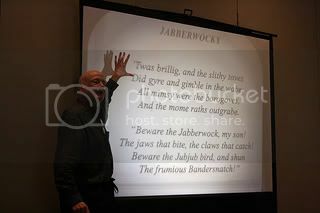 After managing to avoid having my own near death experience, I arrived just in time on Day 1 to grab a bite to eat and listen to Dr. Raymond Moody's keynote address. The topic of the address was "Near-Death Experiences in Ancient Greek Philosophy: The Origins of Rational Inquiry into the Afterlife." 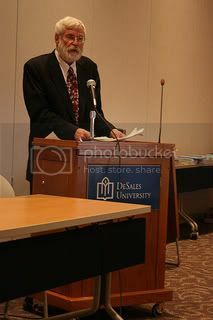 His talk described how the very men who are credited with discovering and developing our current system of reason and logical thinking were concurrently setting the style for rational inquiry into the afterworld. Dr. Moody discussed how figures like Hermotimus, Epimenides, Pythagoras, Heraclitus, Parmenides, Empedocies, Democritus, Socrates, and Plato were also concerned with the phenomena of out of body experiences, near death experiences, channeling and reincarnation. Some of these men were shaman-like figures with visions and experiences of their own to share. 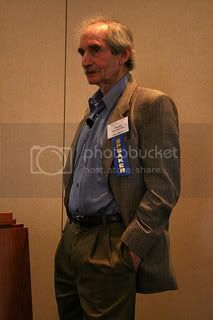 I was very impressed with Dr. Moody's talk, and especially his ease in fielding questions. And Dr. Moody, if you are reading this, please know that the yawning tall blonde in the second row with the watery eyes barely holding up her head throughout your lecture was most definitely NOT bored to tears. She just has time management issues. Day Two of the conference should appear soon...and with pictures! Stay tuned.